The Sunshine State, and its urban gem, Miami, was the destination for the latest Postural Respiration course. Where else does one listen to Cuban salsa performed live outside the local grocery store? 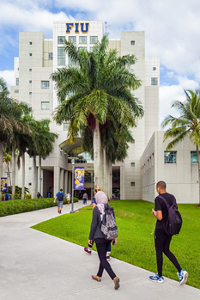 Thank you Cyndi Becker, MS, LAT,ATC, Lauren Reynolds, ATC, and Rodrigo Martinez, DAT, LAT, ATC for hosting at Florida International University, and giving this speaker a respite from the heat and humidity of DC (yes – Miami is more pleasant than DC in mid-July!). For the majority of the class, this course was their first exposure to the paradigm-shifting tenets of PRI, supported by knowledge of human anatomy and by scientific literature that spans many decades and disciplines. We evaluated models from both the power point and in the flesh for evidence of sub-optimal breathing patterns and postural influences: thoracic flat backs, loss of apical expansion, belly and neck breathing, paradoxical breathing, and hyperventilation. We correlated these findings to our objective tests and patient-client complaints. Participants learned the value of establishing and maintaining a left diaphragm ZOA, without which movement quality suffers and the ability to recover sufficiently is unlikely. Our discussion on non-manual techniques included their value in positively changing movement behavior through manipulating the nervous system and shifting the locus of control onto the individual. This group developed solid competency in performing and interpreting PRI objective tests, manual rib techniques, and effective cueing of non-manual techniques. You are ready to go forth and practice in a way that will be forever different than you used to! Everyone facilitated the learning through their questions and comments. A special thank you to our models and readers: Amy Brown, DPT; Erik Kilstrup, CSCS; Rene LeBlanc, MPT, OCS; Rodrigo Martinez DAT, LAT, ATC; Julian Rivera, DPT, ATC, CSCS; Edwin Santiago, CPT, CES, PES, CS; Joseph Vuksanovic, LMT; and David Young, CSCS. A heartfelt “thank you” goes out to Megan Bollinger, DPT, PRC, for her thoughtful comments and great energy in lab. All of you Floridians have a superb mentor in your midst who would love to help you on your PRI journey.